A new paper to be published in the upcoming issue of Marketing Science shows that removing DRM from music leads to a decrease in piracy. Or phrased differently, DRM appears to be an incentive for people to pirate music instead of buying it. The researchers from Rice and Duke University used analytical modelling to come to this seemingly common sense conclusion. The phrase above has been written a few dozen times here on TorrentFreak, and it’s now supported by an academic report. Researchers from Rice and Duke University looked into the effect of digital restrictions on music piracy. In their paper “Music Downloads and the Flip Side of Digital Rights Management Protection” they conclude that DRM doesn’t prevent piracy at all. Quite the opposite. “Only the legal users pay the price and suffer from the restrictions. Illegal users are not affected because the pirated product does not have DRM restrictions,” the researchers write in their report. Ditching DRM and other restrictions would actually reduce piracy according to the analytical model developed by the researchers. “In many cases, DRM restrictions prevent legal users from doing something as normal as making backup copies of their music. Because of these inconveniences, some consumers choose to pirate,” DinahVernik, assistant professor of marketing at Rice’s Jones Graduate School of Business says. 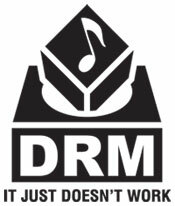 So without DRM, more people would be buying music. And aside from this direct effect, the researchers predict that DRM-free music will increase competition between retailers, which then results in lower prices. Since the paper has yet to be published we can’t review all aspects of the analytical model. But unlike the researchers suggest, their findings are hardly surprising as the effect they describe has already unfolded in real life..
And indeed, those who look around will find that there’s hardly any music being sold with classic DRM in place. Even the RIAA admitted that DRM is an endangered species, probably because what the researchers report today is rather accurate.